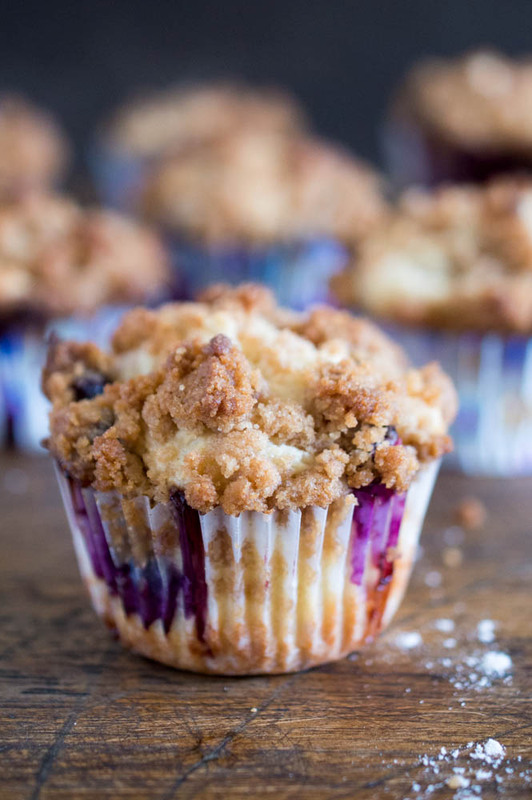 Bakery Style Blueberry Streusel Muffins. Loaded with fresh blueberries and sour cream for extra moist muffins. Perfect start to any morning! These are the best blueberry muffins I”ve ever made. 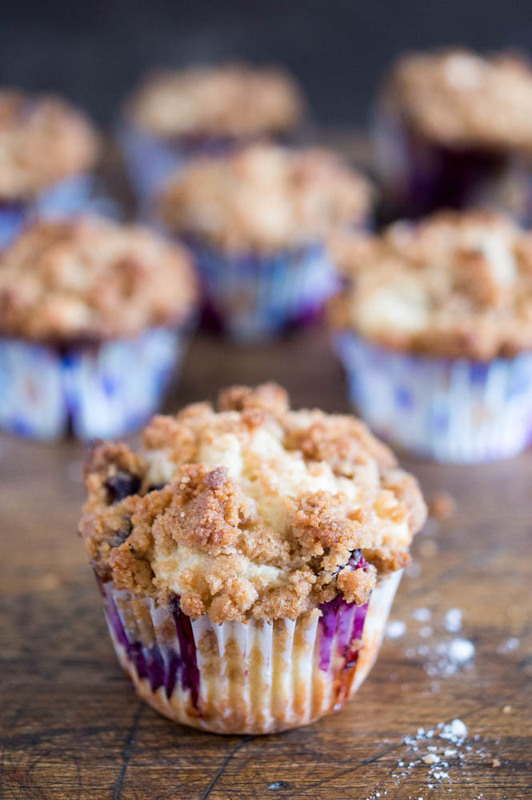 They are super moist, loaded with fresh blueberries and topped with a cinnamon streusel. These muffins are quick and easy to make with no mixer needed. Best of all they take only 30 minutes start to finish! The secret ingredient to make these muffins super moist and tender is sour cream. I tested these muffins with buttermilk and greek yogurt and found that sour cream gives the muffins the best consistency. Super moist on the inside with a slight crunch on the outside. These muffins are tender, moist and fluffy with blueberries in every bite. I added tons of streusel to the top of each muffin (about 1 tablespoon each). This recipe makes a total of 14 muffins. I bake my muffins in two batches using a 12 cup muffin pan. I used only brown sugar in the muffins AND the streusel. Substituting brown sugar versus white sugar gives the muffins an extra crunch on the outside and a moist center. Make sure not to over mix the batter. This will create a tough muffin. Always allow the muffins to cool for 5-10 minutes in the pan before taking them out to cool completely on a wire rack. 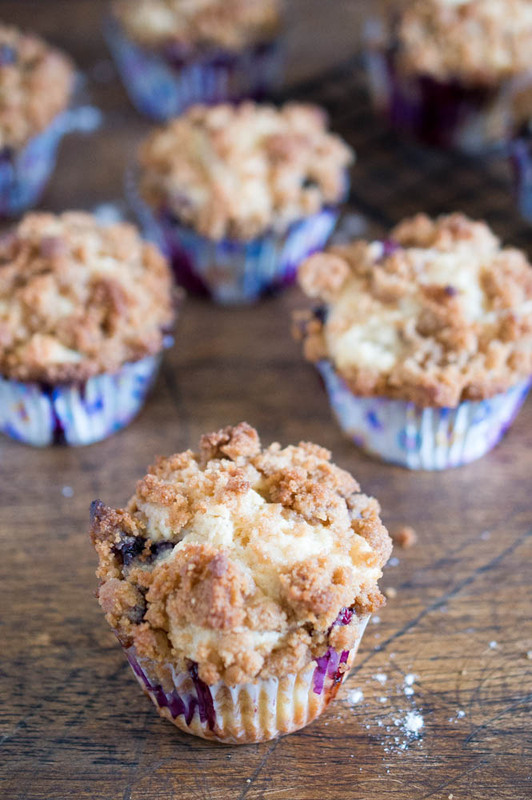 To make these Blueberry Streusel Muffins add all of your dry ingredients to a large bowl. In a medium bowl add all of your wet ingredients and mix. Add wet ingredients to dry ingredients and fold gently. Do not over mix. Fold in blueberries and scoop batter into muffin pan filling almost all the way up. Sprinkle each muffin with streusel. Place in the oven and bake for 20 minutes or until muffins are set. For the streusel mix everything together in a small bowl until it forms the texture of wet sand. Enjoy this perfect on the go breakfast anytime! Add flour, brown sugar, salt and baking powder to a large bowl. In a medium bowl add sour cream, vanilla, vegetable oil and egg. Whisk to combine. Add egg mixture to dry ingredients. Fold gently. Do not over mix. 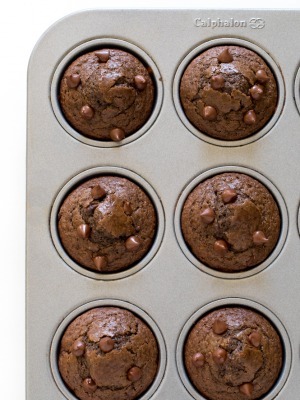 Scoop batter into a muffin pan lined with baking cups. Fill almost all the way up. Sprinkle each muffin with streusel. Place in the oven and bake for 20 minutes or until muffins are set. Stick a toothpick or knife in the center and make sure it comes out clean. Add butter, brown sugar, flour and cinnamon to a small bowl. Mix together until the streusel forms a crumb like texture similar to wet sand. I love how crunchy and delicious these are! 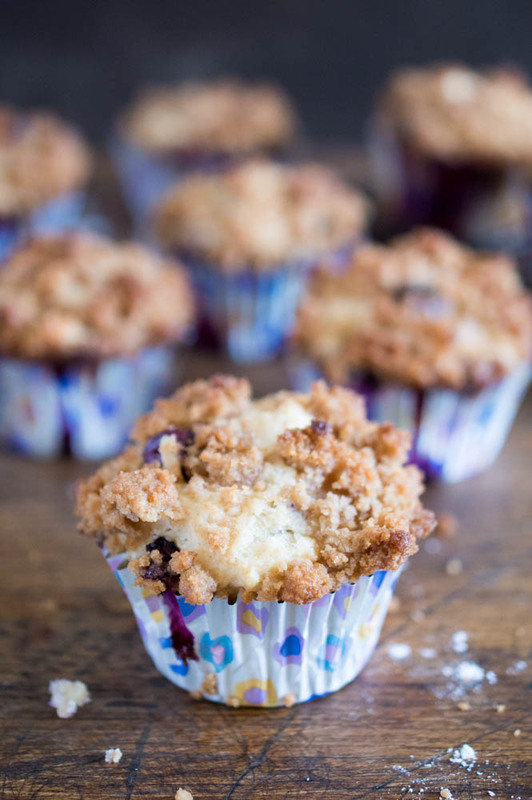 The perfect blueberry streusel muffins! I actually think these would give most bakeries a run for their money! I bet these muffins are so moist. Blueberry muffins are definitely my favourite kind of muffin. These would be yummy on Christmas morning. Well these muffins look just about perfect! I love that you did a streusel topping too. Streusel is always better. Pinned! Ohhh I love blueberry, these muffins are totally calling my name! They look super delicious! I just baked these muffins and they are absolutely delicious, the flavor is very nice, not too sweet, and I really love the texture. This recipe will certainty go into my favorite recipes. Thank you so much Barbara. I am so glad you enjoyed them! I ran out of sour cream and used Greek yogurt for the last 1/2 cup I needed. That seemed to work just fine. I made the recipe while looking at my mobile phone and was too lazy to scroll down to the directions. The recipe was actually very forgiving, but it might have been easier to stir if I had mixed the dry and wet ingredients separately as the recipe directs, and then folded the wet ingredients into the dry. I had a ton of streusel topping left over, so I might suggest halfing the streusel recipe to those who are light with the streusel sprinkling. I added some oats on a few muffins, and that was a nice touch. Thank you so much for the recipe. I’m looking forward to using it again. I’m proud to have your muffin photos pinned to my Pinterest wall. Thank you for your feedback Eve! I’m so glad you enjoyed them! Just made these now. Substituted plain yogurt for sour cream as I didn’t have it. Really nice texture and crunch, could be a bit sweeter for me but otherwise good! I made these this morning with fresh blueberries from the local farmers market and they came out awesome! My family and I love them. Delicious! I wouldn’t change a thing! 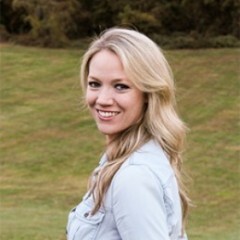 So glad you liked them Heather! I was not really fond of this recipe. I followed the instructions just the way they were and the muffins didn’t come out that great. I use a lot of recipes from the internet and I will not be using this one again. It had to be one of the worst blueberry muffin recipes I have tried. Thank you so much for trying this recipe. I am so sorry it did not come out the way you liked. I have personally made this recipe numerous times and it has come out great for me each time. I have also had readers comment that they loved the recipe. Not sure why they didn’t turn out for you. I tried this recipe today and it was delicious easy to follow directions. I am so happy I came across this recipe thank you! Thank you Krista!! I am so glad you enjoyed them! These were fantastic! I added the zest of 1 lemon because I love the combination of lemon and blueberries. I also added 1/2cup of white sugar to the batter based on some of the comments that these were mildly sweet (I like sweet) and they turned out great. This recipe is a keeper. Thanks for sharing! So glad you enjoyed them Jessica!! Thank you! nice texture , moist but not sweet at all for my taste they were even tart.. the fresh blueberries definitely require more sugar. disappointed. I should have read all the reviews first. I am sorry you didn’t care for these. I will look into adjusting the amount of sweetness. These should be labeled the Ultimate Blueberry Muffin. How could anyone not like these. I made them and my husband took some to work and I am getting text from co workers saying how wonderful and yummy and that they are the best muffins they ever tasted. So glad I found this recipe. I just printed out a couple copies to hand out. I am so glad you enjoyed them!! Thank you so much! Hi Kelley, Have you ever tried baking the batter as a loaf rather than muffins? If not, do you think the batter will work as a loaf? I have not tried baking this one as a loaf. It don’t see why it would not work as a loaf. I would bake at a lower oven temp maybe 350 and cook for 40 minutes and test to see if it’s done. Your recipe looked yummy. I have it in oven now. more like a biscuit batter/hard to just fold in the blueberries. So I added about 1/2 c. of milk. Looking forward to enjoying the muffins. Note: the batter is thick almost like cookie dough, but it comes out moist and delicious!!! Terrific recipe! OK everyone, these ARE the perfect muffins! I’ve now made a few different batches for different occasions, including Christmas morning, so let me fill you in. Q: Can you refrigerate it? A: Unfortunately I’m going to say NO, this is not a make ahead thing. I refrigerated half of a batch for 24 hours, and they came out very different than the ones from the same batch I made right away. The refrigerated ones were doughy, almost chewy, and honestly I couldn’t eat them, so I don’t recommend refrigerating the dough. Q: Can you do minimuffins? A: Yes! Bake time at 400 is about 10-12 minutes instead of 20 minutes. Use a toothpick to test center. A: I’m a lover of sweets, so I tested this recipe as is, and then with an extra .25 cups of sugar. The extra sugar is just not needed. The muffins do t need to be sugary sweet because the topping is. Think cheesecake—sweet but not overly sweet, and a topping takes it the rest of the way. Q: Some said it’s too much streusel, is it? A: Nope! 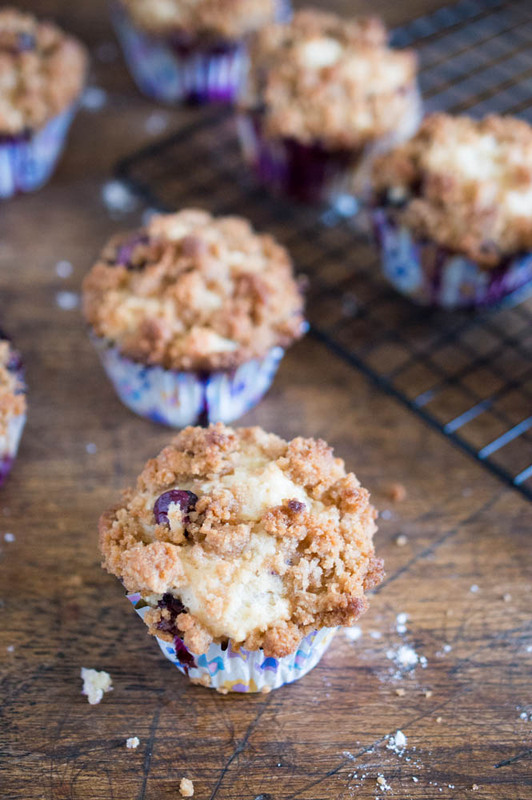 It’s exactly enough to cover each muffin in a layer of streusel. Now if you are just looking for a decorative streusel topping, sure cut it in half. 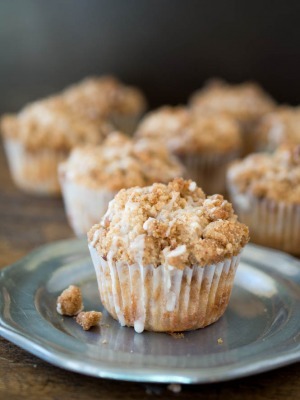 But if you want to enjoy your streusel as much as the muffin itself, this recipe is perfect. Q: does the don’t need extra liquid if it comes out looking thick? A: No!!! Don’t do that. The door will look almost like squishy cookie dough. This is what makes the muffins very solid but extremely moist. I make these muffins often and they are absolutely delicious!